Can you believe we are on week six of the Lucky Charms quilt already? I was honored to meet up with Pat Sloan at the Empire Quilt Guild Show in New York City this weekend. We were able to chat for a few minutes and get a quick photo taken. So now I can show you how I quilted the green border on the quilt designed by the lovely and talented Pat Sloan! First, I sectioned the border into 4-inch segments using chalk. Then I pulled out my Quilter's Preview Paper. I drew one swag in each section of the border. I had a petal idea for the corner and needed to see if it played well with the swags. It did. I like when I get lucky with the first design. Now I am ready to quilt. Tutti, a 50-weight multi-color cotton from WonderFil, color TU 28 Lime. Last week, Barbara commented that she used the diamond design on one of her quilts. Has anyone else stitched these designs out? I would love to hear your success stories! Next week I will show you how to quilt the black triangles. 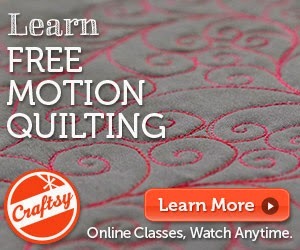 Would you like a free quilt pattern? My dear quilty friend, Kim, is having a giveaway today. Sign up over at her blog. I BROKE 100 YARDS!!!!!! I have over 100 less yards of fabric today than I did on January 1, and I can't see a bit of difference in my sewing room... sigh. Head on over to Judy's blog to see how everyone else is doing. I am going to New York City this weekend. There are a lot of quilty things going on there this weekend. I am going to The Empire Quilt Guild Show. I will be hanging out with the folks from the The Quilt Basket. They have a booth at the show. If you are going to be there, stop and say hi! You should also check out Infinite Variety a huge red and white quilt exhibit at the Armory sponsored by the American Folk Art Museum. I am so sorry to have to miss that one. I finally did it... I cut into my Happy Fabric Collection. Every week, I work at a different quilt shop or quilt show. As you can imagine, the shopping can get out of control. I try to keep it in check, but sometimes fabric just follows me home. It might be a fat quarter or it might be a yard (or three!). I have a lot of Kaffe Fassett fabrics, as well as fabrics from Mark Lipinski and Joel Dewberry. The fabrics are not made to go together, but since they all make me happy, they have become my Happy Fabric Collection. A year ago or so, I saw the New Wave patter on the Oh, Fransson! blog and knew this was the perfect quilt for my fabric collection. I started the quilt, and as usual, did not finish it. I have no idea what I am going to do with this quilt, but it is on display in my living room until I decide. Check out what others have Finished for Friday! This week, I get to show you how I quilted the little green triangles on my Lucky Charms quilt. I like it and am ready to quilt. Next week I will show you how to quilt the large green border. I spent all of last week at the AQS Show in Lancaster, PA and did absolutely no stitching! A couple of years ago, my friend and I took a quilt quilt class. I finally finished the quilt. I'm quick like that. My son's girlfriend (who is now his wife) really wanted this as a baby quilt for the future. Well, it's the future. I'll put this in the pile with the other baby quilts. I'm ready whenever they are. Thanks for stopping by today. I absolutely can not wait to show you how I quilted the white border on my Lucky Charms quilt! I knew I wanted to quilt diamonds, so I pounced one-inch lines in the border using a one-inch stencil and a Quilter's Pounce Pad. The white powder does not show up very well on the white fabric, but I can see the marks on the green and orange fabrics quite well. I pulled out my roll of Quilter's Preview Paper to see how single diamonds would look on the side border. I drew double diamonds in the top border. I think I like the double diamonds better. Diamonds don not turn corners very well. Choosing a contrasting design, I drew a sunburst-type design in the corner. I think I like that one, too. I am ready to quilt! I decided to be bold and try quilting with a colored thread on the white fabric. I chose Tutti, a 50-weight multi-color cotton from WonderFil, color TU 28 Lime. Even though the thread has several shades of bright green in it, it looks almost solid against the white fabric. When I look at the quilting closely, though, I can see the richness of color in the thread. Delightful! The white border is finished! Is anyone trying out these patterns at home? I would love to hear how the patterns are being used! Link to photos if you have them, please! Sadly, I have to wait until next week to show how to quilt the little green triangles around the black and white rectangles. I can't see my design wall right now. I am setting up at the AQS Show in Lancaster, PA! If you possibly can, come and see this show. And come and say hi to me at the Handi Quilter booth. Head on over to Judy's blog to see what everyone else is doing. My friend's son Adam graduated from high school last June and I only recently finished his quilt. Oops! I added borders to the quilt since Adam is one rather tall young man. The border and backing fabric were purchased during my trip to The Patchwork Company last fall with my friend John. I felt guilty purchasing so much fabric that day, but I had this quilt in mind. I had a few other quilts in mind as well, but they remain unfinished for now. Are you ready to see the fun quilting I added to Lucky Charms this week? I quilted all of the black and white print rectangles. Since the prints are so busy, the quilting is not going to show up very much. I decided to quilt a simple X across each rectangle. Once again, I pulled out my Quilter's Preview Paper to see how it would look. Once I drew all of the Xs, I noticed that they formed a channel between the rows of rectangles. I know it is hard to see in the photo, but it will become more clear in a bit. It is easier to see if I take the Quilter's Preview Paper off of the fabric. I stitched in the diamonds first using the HQ Mini Ruler. And then I filled in those channels with ribbon candy. I love the way this quilting turned out, mostly because it was a surprise. I did not realize the Xs would form a channel. I was also surprised that when I quilted the ribbon candy, the diamonds popped off the quilt. Next week I will tackle the white border. Come back and check it out! I have no grandchildren and I need to stress that my son and his wife ARE NOT EXPECTING. I repeat: there are no babies on the way! Having said that, I can find no reason not to make quilts for my non-existent grandbabies. I made a new sample of my Too Hip to Be Square pattern using Bear Essentials from P & B Textiles. Won't this quilt be a perfect floor quilt for when my future grandbabies come to play at my house? I chose bright orange thread for the entire quilt because, hey, why not? And in case you weren't paying attention at the beginning of this post, I'll say one more time: I am not expecting to become a grandmother any time soon. No babies. Got it? I don't want to start getting phone calls about this. Hurray! Today I get to show you how I quilted the orange borders on my Lucky Charms quilt. I thought about quilting swirls. Since the border finishes at one inch, I used a one-inch stencil and a Quilter's Pounce Pad to divide the border into one-inch squares. I thought that it would look nice if I quilted a swirl in each square, but I like to be certain before I start quilting. I pulled out a roll of Quilter's Preview Paper and drew out the design. Yep, I like it. Ready to quilt? Next week, I will quilt the black and white rectangles.